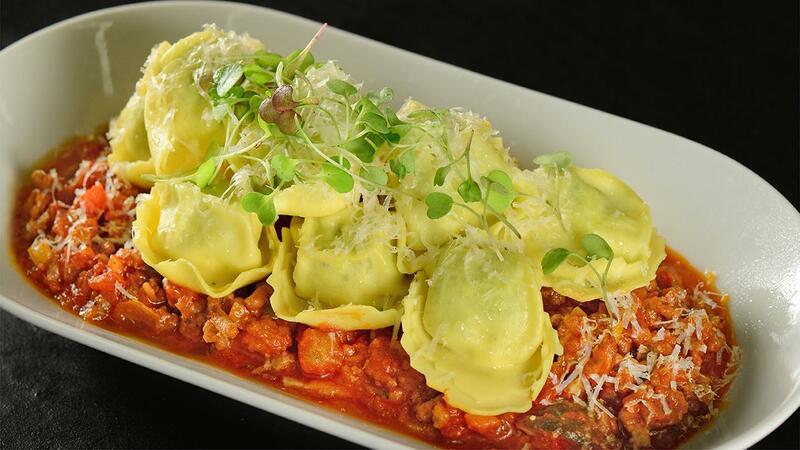 The flavour combination of a rich meaty sauce followed by a burst of tree cheese filled tortellini’s is magical. Two classic italian elements coming together to produce a top selling dish. One to add to the menu, even the kids menu. Divide the pasta dough into quarters. Work with one piece at a time and keep the other pieces covered. Cut the sheet into rounds using a 3" round cutter, spacing the rounds as close together as possible. Gather the scraps into a ball and put them with the remaining pieces of dough to re-roll later. Place 1 teaspoon of filling in the middle of each round of pasta. Dip your finger in the bowl of water and run it along the edge of the round to moisten. Fold the dough over to form a half moon, then draw the two corners together to form a rounded bonnet-shape. Press tightly to seal. Toss with flour, set aside on well-floured baking sheet, and cover. Repeat with remaining pieces of dough, re-rolling the scraps. Heat olive oil in a large pot over medium high heat. Add meat and season with Knorr Chicken Seasoning Powder. Add onions, garlic, celery, capsicum and carrots and cook until meat is browned. Add mushrooms and continue to cook for 5 minutes, stirring occasionally. Stir in Knorr Tomato Pronto. Simmer gently uncovered for 10 minutes, stirring occasionally. Adding a little additional Knorr Chicken Seasoning Powder if needed. Garnish with fresh basil & parmesan cheese.